In Rancho Texas Lanzarote Park we feel that environmental education is a way to activate the sensitivity of all people who visit us towards the almost unknown environment in which we live. We also believe it is a way to develop behaviors of respect for ourselves and the world around us. Therefore, Rancho Texas Lanzarote Park has developed an environmental education program taking advantage of features in the theme park. Within this program we propose two different aspects: One formal a structured program directed to school children and a non-formal education is based on general environmental information and that it is for the public. 1. Freelance group visit where it is the teacher who leads the school group round the proposed routes, giving practical meaning to the program related to the work in the classroom. 2. Guided tour in which the group is accompanied by an educator of the park and are introduced into the animal world through a fun course in which students will have to solve puzzles and interactive teachings. Within this option there are different themes to be chosen from to do a specific tour related to that theme. 3. Environmental and interactive classrooms: During this program students are the important ones, they will debate and learn skills related to current fauna and flora problems and therefore will learn how to respect wildlife participating during the visit in enclosures designed for this purpose. Since 2008, the birds of prey classroom is available for all schools. Moreover, the educational program provides educational tours aimed at non-school population sectors as families with children, adult population and other sectors. We are in constant contact with local councils and associations in general for any type of protective environmental education. 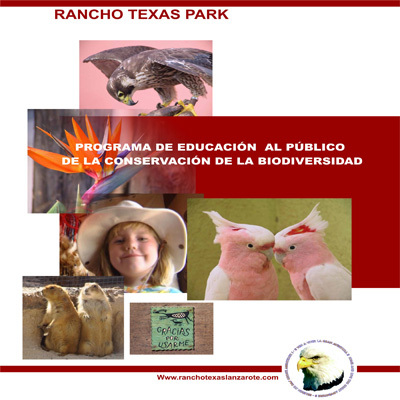 Rancho Texas Lanzarote Park makes a great effort to work with all schools on the island so that their school trips to our park can be done simply, safely and comfortably and schoolchildren have environmental information first hand through experience.